The pattern is available via Craftsy for $1.99. Click to purchase the Hootin' It Up Project Bag pattern. Designed by Arwen Golden, donated by Yarn Garden. The pattern is available via Ravelry for $4.00. 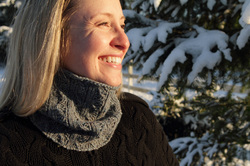 Click to purchase the Chalet Cowl pattern. 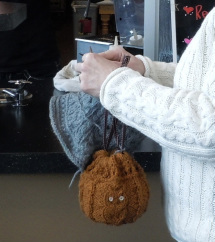 Designed & donated by Fancy Image Yarn. This pattern is not available for purchase online. 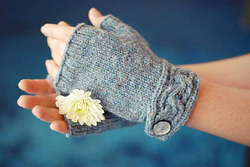 Click to purchase the Lupine Mitts pattern. Not available for online purchase at this time. Designed by Morgen Daily especially for the 2011 Seattle to Portland Yarn Train goody bag. Use your favorite worsted-weight yarn to create this neckwarmer. Brooklyn Tweed's new woolen yarn, Shelter was used to knit the neckwarmer. An option is included that converts the neckwarmer to a hat. Cost $4.00. After payment, pattern will be delivered via electronic PDF to you..
Click to purchase the Neckwarmer pattern. Designed by Charisa Martin Cairn, to complement Morgen Daily's neckwarmer design. 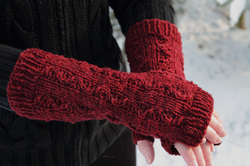 Charisa is donating all proceeds of the pattern sale to the Snohomish Knitters Guild. Cost $3.00. After payment, pattern will be delivered via electronic PDF to you. Click to purchase the Wristers pattern.